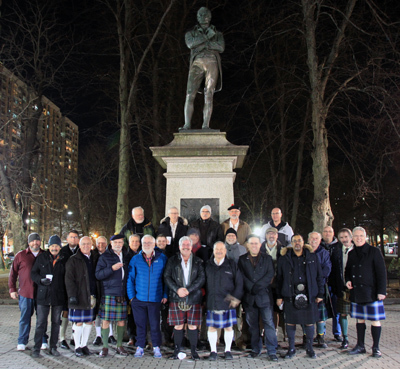 We are a men's association in Halifax, Nova Scotia. We celebrate the life and works of Robert Burns and promote Scottish heritage. Our organization is based on the Tarbolton Bachelors' Club founded by Burns. Like the original club, we seek to be “a diversion for the weary man worn down by necessary labours of life”. We have an active choir which is welcomed at numerous venues about town. Our members perform other work for good causes. Our Burns Supper is a highlight of our social year. It is highly regarded for its good times and top speakers. We assemble on the first Thursday of the month between September and June. Our meetings typically include poetic readings and songs of Robert Burns. Like the Tarbolton Club, formal debates are held from time to time. In keeping with the Tarbolton tradition, our members are all male, although we have dropped the requirement to be a bachelor. Membership is by invitation and is limited to 37 men, one for each year that Burns lived. The next club meeting will be on the 2nd of May. We will assemble at 19:00 for 19:30 in the Windsor Lounge at Juno Tower in the C&PO's Mess. © 2010-2019 Halifax Burns Club. All rights reserved.